Medical cannabis patients are embracing vaping CBD as a way of quickly getting the benefits of cannabis, without the high of THC and the health risks of smoking. The psychoactive properties of cannabis may be what recreational smokers are looking for, but medicinal users – and especially those who need to take treatment at work – cannot afford to be “high”. By vaping CBD, genuine relief and relaxation can be achieved, with no short-term cognitive drawbacks. Before you can do anything, you’ll need to work out what you want to vape and then purchase an appropriate vaporizer. Some choose to vape dry herb, but CBD vape oil and e-liquid is popular, as are concentrates like wax. High-end vaporizers will accept concentrates, e-liquids and dry herbs, while others just take one or two of the three – so bear this in mind before buying. For those who want a clean vaping experience, disposable CBD cartridges are suitable as these can simply be fit to the device and then thrown away after use. Cartridges also tend to release a set dose of CBD with each inhale, which is ideal if trying to keep to a strict dosage. A first-time vaper will probably find an e-liquid bottle containing 25 to 50mg of CBD effective, whereas a more regular user will likely need increased potency into the hundreds of milligrams. Full-spectrum CBD e-liquid has a higher therapeutic value than a CBD-isolate oil, thanks to the presence of terpenes like linalool and myrcene, and non-psychoactive cannabinoids such as cannabigerol (CBG). These compounds are not as well-known as they have been studied in less depth, however there is evidence that taking a whole-plant extract is more effective than an isolated extract. It’s also worth investing in a vaporizer that comes with USB charging functionality if you plan on carrying your device around – being able to boost charge practically anywhere is a nice bonus and makes a portable vaporizer genuinely portable. 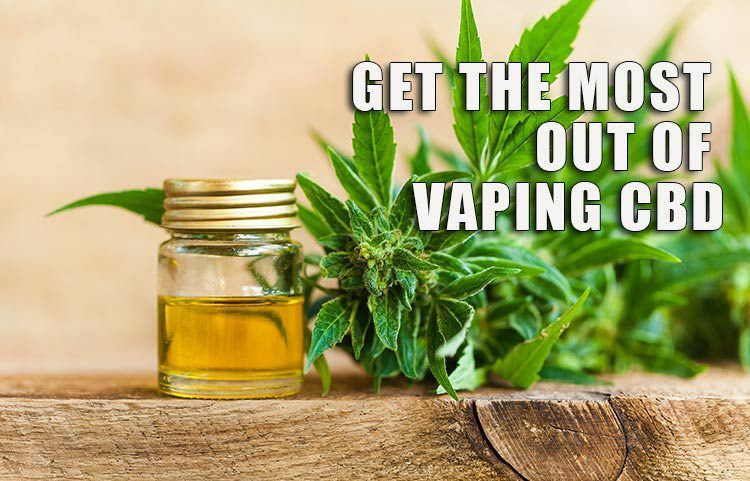 It’s important to purchase a CBD e-liquid that is compatible with the vaporizer you have – not all e-juices can cope with oil made using a vegetable glycerine (VG) base, because it is more viscous. New vapers should start with low wattages to become acclimatized with the temperature and flavor of the vapor, and how it feels to inhale. After getting more comfortable, it’s fine to start increasing the wattage to produce warmer vapor and experience a throat hit – some find this pleasurable, although others find that it makes them nauseous. There’s no requirement to vape at a high wattage, and only by experimenting will a vaper know what suits them best. There is a lack of long-term research on the risks of smoking cannabis, and while it may not be as dangerous as tobacco smoking, it’s still carcinogenic and a stressor for the lungs. Furthermore, free radicals are found teeming in all types of smoke, and these uncharged molecules can accelerate deterioration of the skin. With the new science and products on the market, smoking cannabis is no longer necessary. Moreover, an increased percentage of cannabinoids make it into the bloodstream when vaping, as they aren’t being destroyed through combustion – therefore some find vaping to be more potent. It wasn’t long ago that cannabis was being accused of exacerbating anxiety, due to the psychoactive effects of the most abundant cannabinoid in the plant, THC. However, CBD research has demonstrated potent anti-anxiety effects. Instead of inducing an intense euphoria, CBD is mellowing and brings relaxation throughout the body. In moderate doses, it can have a positive effect on the mind, increasing concentration. The anxiolytic effects of vaping CBD last for around three hours, but kick in just a couple of minutes after inhaling. For many people, anxiety symptoms tend to be acute, with sudden anxiety attacks flaring up from nowhere – therefore, the quick onset of effects is welcome. CBD e-liquid is easier to accurately dose with than cannabis flower, because there is no way of telling how much CBD is on the flower you’re using, as it varies due to an uneven spread of cannabinoids. This isn’t the case when you’re using CBD vape oil, as the amount of CBD in each bottle is made clear on the label. By only taking small doses, you’re only medicating with as much CBD as you need, and then when the effects begin to wear off you can just top up. Larger doses may feel good but can be inefficient. If you aren’t vaping in the privacy of your own home, then you may experience a few difficulties when doing so in public. Sadly, not everyone is on-board with vaping and the exotic flavors from various e-juices. However, vaping unflavored CBD is not as obvious as vaping a pungent e-liquid or cannabis itself. This allows you to be stealthy and vape without attracting attention – especially if you’re using a vape pen. Anyone who’s been around a regular smoker will know that the stale stench gets into their clothes. This doesn’t happen with vaping – the smell dissipates quickly and does not linger. Hemp-based CBD products – even those that are full-spectrum – can be purchased in all 50 U.S. states with no need for a medical cannabis card or doctor’s prescription. However, there are benefits to speaking with a doctor if you have an unusual situation and are planning to self-medicate with CBD. 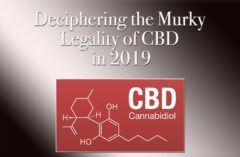 In recent times, consumers have become more aware about which CBD products are good and which ones aren’t, with the topic receiving increased attention in the media. E-liquid companies that have products third-party tested are more trustworthy than those that don’t. A lab test will confirm the source of the extract, how the extract was taken (ideally via supercritical CO2 extraction) and how much CBD (and other cannabinoids) is present.